Who can resist the tenderness of pork belly, the umami flavour of Asian ingredients and the punch of chilli in a recipe? Certainly not me! This sticky braised pork belly takes inspiration from Asia to give a straightforward meal idea that everyone can achieve. This recipe cannot necessarily be pinned down to one specific Asian cuisine but I have mixed and matched my favourite ingredients to give the perfect balance of flavour. I have used gochujang which is a spicy paste made from fermented soya beans. You can buy this online at http://www.souschef.co.uk or find it at your local Asian supermarkets if you have one. 1.To begin, cut the pork belly into inch sized pieces. Bring a pan of water to the boil and blanch the pork belly chunks for 2 minutes to draw out any impurities before removing from the pan with a slotted spoon and setting aside. 2. Heat a wok over a low to medium heat and add in the oil and sugar. Cook until the sugar is melting before adding the pork chunks. Cook until the pork is beginning to turn golden- remember to brown off on each side of the pork chunks for an even colour and flavour. 3. At this stage, lower the temperature of the wok back to low and add in both kinds of soy sauce, the sake or shaoxing wine (whichever you are using) and water. Cover the wok with a lid and simmer the pork for approximately 1 hour 30 minutes to 1 hour 45 minutes until the pork belly is meltingly tender. Remember to check the pork from time to time during the cooking process and add a splash more water if it starting to stick to the pan or becoming too dry. 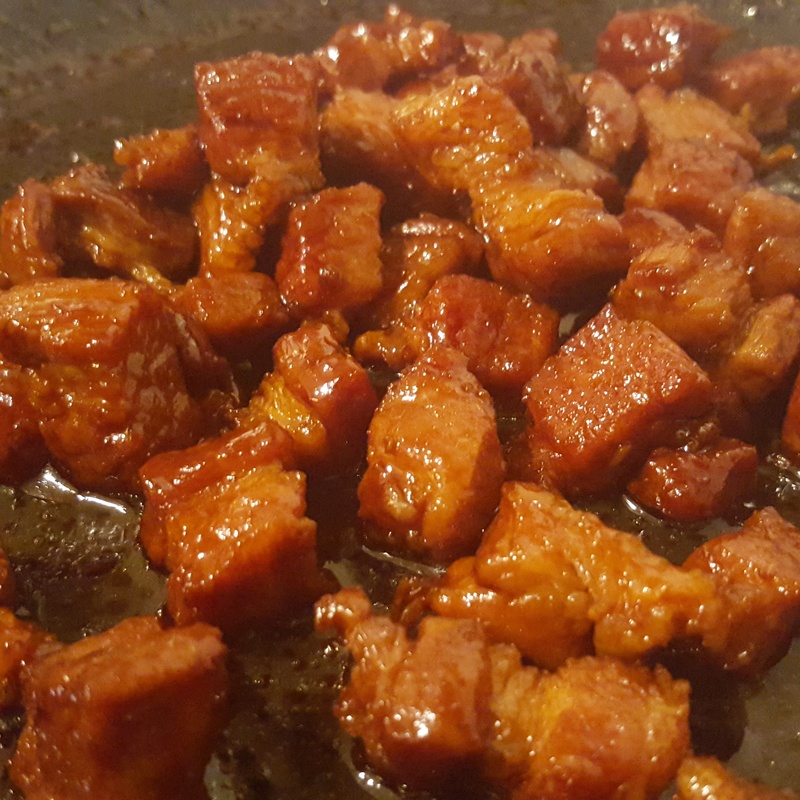 If, at the end of the cooking, you have excess sauce then simply remove the lid of the wok, increase the heat slightly and reduce so it ends up being a glossy, sticky glaze over the pork and that’s all there is to it! Serve with rice and Asian greens if you like and dig in! Asian inspired sticky braised pork belly- a recipe you will come back to time and time again! Chow mein is a staple of Chinese meal which is speedy to prepare and so delicious that you’ll never need to order it from your local takeaway again! I have used beef here but it can easily be substituted with pork, chicken or prawn- or perhaps even a combination of them all. Like most of the Asian dishes I cook, this takes next to no time to prepare and assemble but just make sure everything is chopped and shredded before you start to make it even easier. 1.Start by cooking the egg noodles according to the packet instructions; drain well and set aside. 2. Slice the minute steak into thin strips or bite sized pieces depending on your preference. Heat the groundnut or vegetable oil in a large wok over a medium to high heat and cook the beef until it is catching some colour and starting to cook through. 3. Add in the garlic, spring onion and peppers to the wok and cook for a further 3-4 minutes until the vegetables start to soften. Lower the heat and stir the egg noodles through. Pour in the dark soy and rice wine along with the pak choi or beansprouts depending on what you are using. I’m a fan of all Asian greens so pak choi or choi sum usually get my vote! I separated the leaves from the thicker stems of the pak choice; shredded the leaves and then cut the stems into thin strips to add extra texture. 4. Finish off by drizzling the sesame oil, a sprinkle of toasted sesame seeds and toss well to combine just before serving. Make sure the noodles are heated through and serve in large bowls with chopsticks (or a fork if chopsticks equal horror for you!). 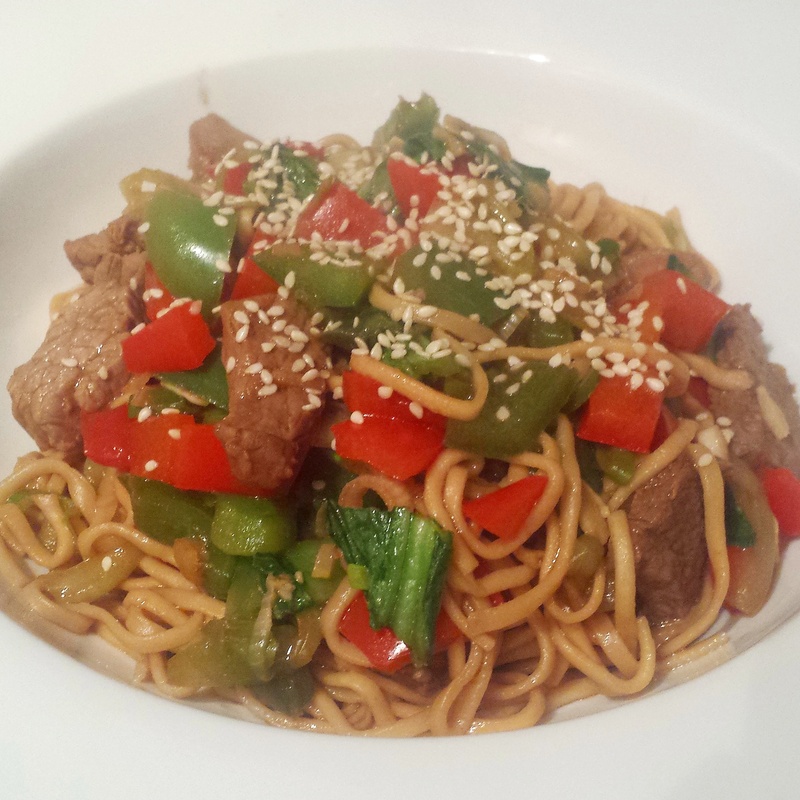 Speedy beef chow mein- a perennial Chinese favourite that you can whip up in minutes at home! This has to be one of the most ordered and eaten dishes in Chinese restaurants so this is my take on it. The key here is to prep everything before you get cooking as once you get going it is really quick. I have used cashew nuts as a bit of a change as I find they give a creamier finish but you can use peanut if you like. The recipe calls for Facing Heaven Sichuan chillies and they can be bought from Spice Mountain- you can visit them in Borough Market in London or online here. I challenge you to only buy those and not all the other chilli based goodies on offer! 1. Start off by marinading the chicken breasts pieces in the soy, rice wine and corn flour. Make sure that when you combine the ingredients that the cornflour had no lumps- give it a good whisk! Cover and leave to rest for around 15 minutes but a little longer if you have time. 2. Mix together all the ingredients for the sauce and check the levels of sweetness and heat so it suits you. Set aside. 3. When you are ready to cook, simply add a splash of groundnut oil to a hot wok and fry the dried chillies for a minute or so. This may smoke a little so be careful- this releases the flavour of the chilli. If you can’t get hold of these specific chillies, any medium heat dried red chillies will be fine. Next up goes the chicken pieces and the peppers; cook the chicken so it is nearly cooked through. Add the sauce you have set aside and the rest of the ingredients except the nuts and onions and then stir well. The sauce should begin to reduce down and leave a coating over the chicken. Just before serving, add in the onion and nuts to warm. Serve with rice and Asian greens and dig in. 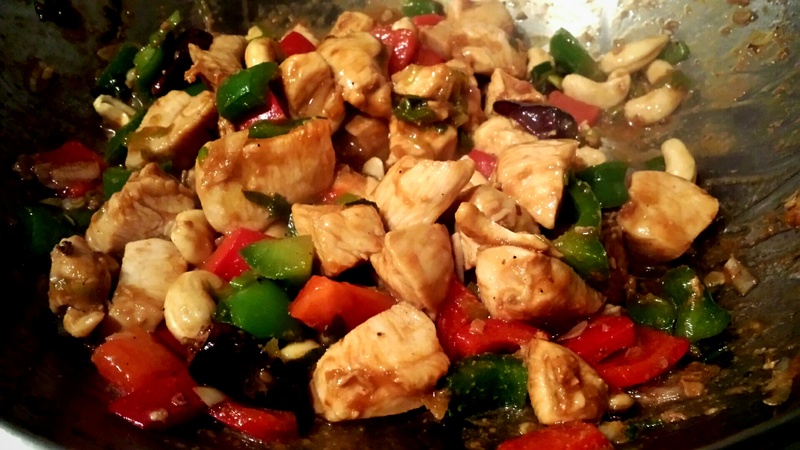 Kung pao chicken- you’ll never pick up that takeaway menu again!